Today we have two juicy items for those of you salivating for some fresh tunes. First things, first...I'm not a huge fan of album teasers or 'previews' as they are sometimes called, because with some music you just can't get a fair taste of what you are going to get should you choose to purchase the album. So far, the preview is the only legitimate piece I have found from the movie Cloud Atlas. 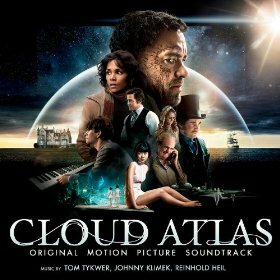 If you have not seen Cloud Atlas, I sadly cannot recommend it because I have not seen it. I have not even watched the full trailer, so I have no idea what takes place in the movie. However, being an avid fan of film score music, I have been eagerly anticipating the soundtrack to Cloud Atlas. The film features Tom Hanks and Halle Berry to name two. Tom Tykwer, Johnny Klimek, and Reinhold Heil are credited with creating the music in the film. What I have heard so far is the same thing I'm embedding here. The music is mostly quiet, minimalistic orchestral compositions interspersed with some creative, spatial electronic moments. I'm all for trying new technology in film scoring, so this was not worrisome at all. I indeed like what I have heard, but some of it lacks in the 'epic' factor that I enjoy so much. Of course, this is coming from hearing just the first minute or so of each track. The good news is that film compositions often start off quiet and build toward a grand climax. That is what makes motion picture music so...moving. Take a listen to the soundtrack preview below.